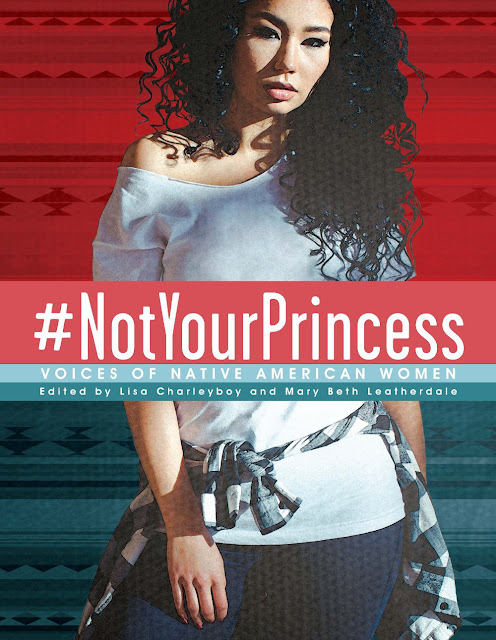 #NotYourPrincess: Voices of Native American Women is another outstanding collection edited by Lisa Charleyboy and Mary Beth Leatherdale. Released on September 12th, 2017 from Annick Press, it is one you'll definitely want to add to your shelves--alongside their other two books--Urban Tribes and Dreaming in Indian. Let's start with the title. The hashtag title is perfection. 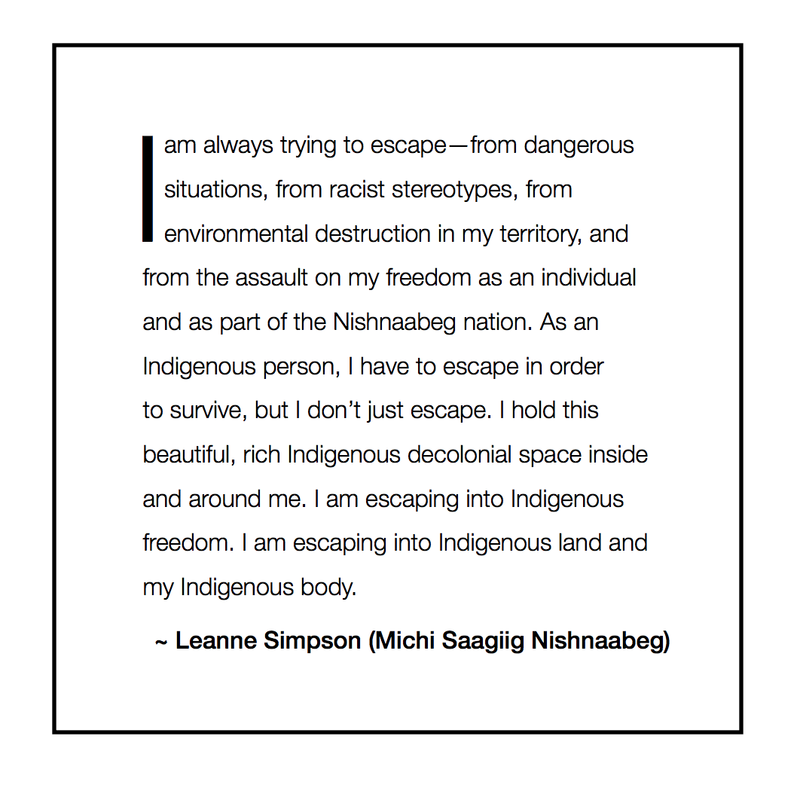 It boldly says that Native women are here and we have things to say. Some of you may know that a lot of activism takes place on Twitter. Native people have been creating and using hashtags to inform others about the things Native people care about. Did you, for example, follow the conversations that took place using #NotYourPocahontas and #NotYourMascot? Turning the pages, it is easy to see why Lisa Charleyboy and Mary Beth Leatherdale put these two items side-by-side as an opening for the book. 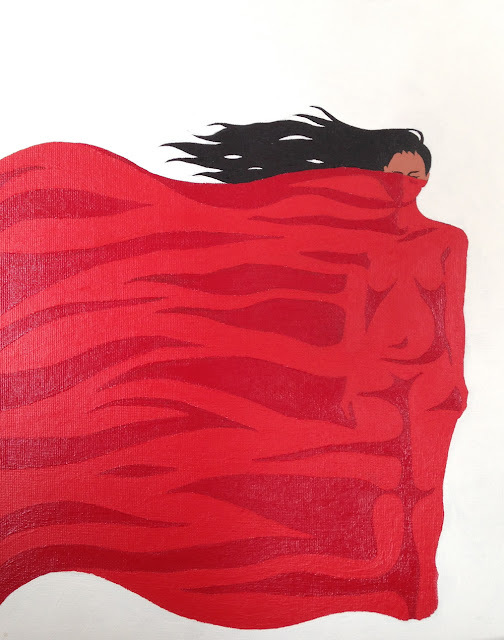 With them, I am visually and textually drawn into an Indigenous space that wraps me in a warm embrace, and that--in some instances--pierces that warmth with truths, but right away, brings me back to that place of knowing the power of Native women. The world before them is still open. She is a self-taught ledger artist. The ledger behind the woman in the painting signifies ancestors who were at boarding schools, while the child she carries embodies the future. I mean it when I say that I'm sitting here, blinking back tears at the beauty, the power, and the resilience in #NotYourPrincess. I'd love to upload images of every page, but of course, won't do that. 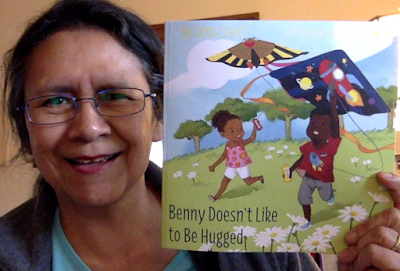 What I will do, is tell you to get a copy right away for yourself, and for Native teens in your life. I sang the praises of Dreaming in Indian and of Urban Tribes but there's a quality to #NotYourPrincess that... well, that I don't have words for yet, that do justice to how it is impacting me. 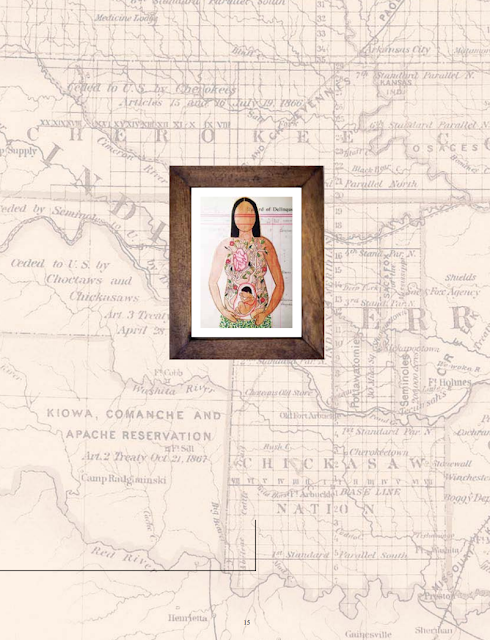 The work of 58 different Native women is in #NotYourPrincess. Art, words, photography. What you see and read in this book will linger in your head and heart. Debbie--have you seen ALL KINDS OF FAMILIES by Mary Ann Hoberman? With irresistible, rollicking rhyme, beloved picture book author Mary Ann Hoberman shows readers that families, large and small, are all around us. From celery stalks to bottle caps, buttons, and rings, the objects we group together form families, just like the ones we are a part of. And, as we grow up, our families grow, too. 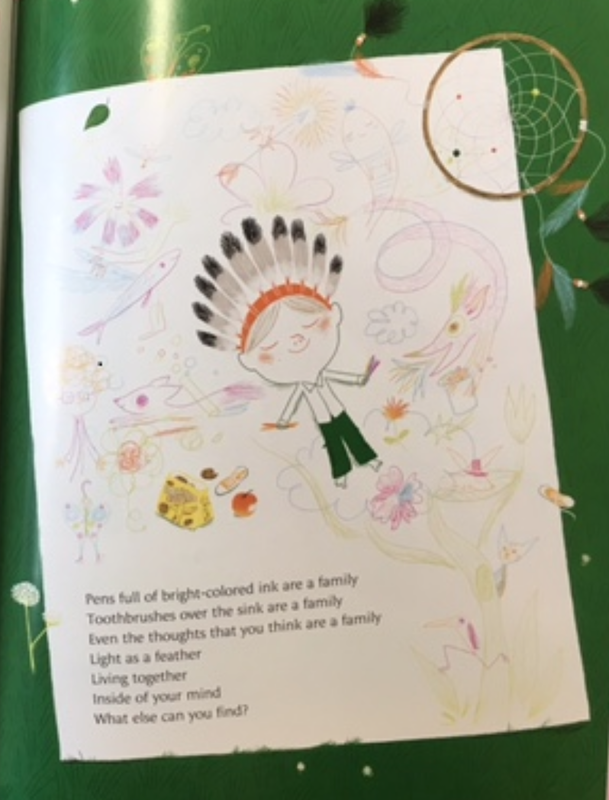 Mary Ann Hoberman gives readers a sense of belonging in this all-inclusive celebration of families and our role in them. If you've got either book in your library, consider talking with children about stereotypes. If your collection development policy has language in it about accuracy of information, you can remove these books. "A resource for finding diverse books"
"Helps users find diverse picture books"
"Wonderful site! I need to get my hands on these books!" "Makes it easier to find diverse books..."
Lot of enthusiasm! So, I went to take a look and tweeted my observations as I looked through it. With this post I want to say a bit more than I said on Twitter. First, some background: the country is in another of its many periods where people are working hard to promote books that accurately represent marginalized peoples. At some point, it will not be another period of this kind of work. It won't be necessary. Data shows, however, that we've got a long way to go to get to where the body of literature published/republished each year is not that "all white world" that Nancy Larrick pointed to in 1965. The Diverse BookFinder project is one of many in the works right now. 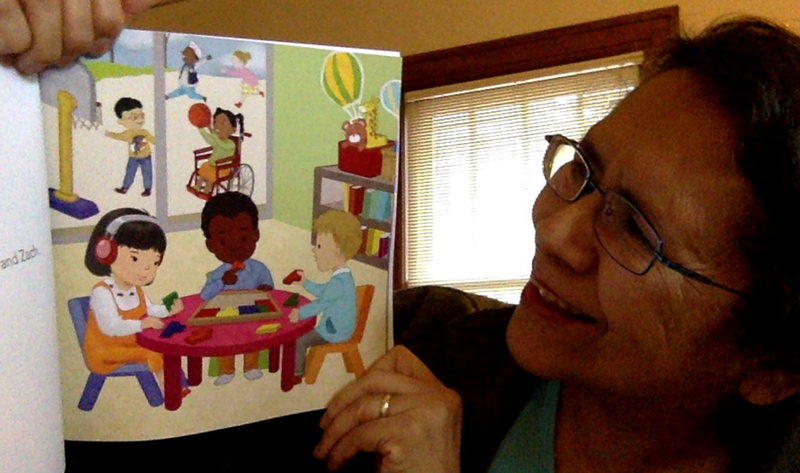 We Need Diverse Books launched its Our Story app a few weeks ago. I recommend it. I spent time going through it. Even more recently, Kirkus partnered with Baker & Taylor to help librarians find books. I have not had a chance to look through that one. And--I'm part of the See What We See project, and I'll also be working with the newly funded Diversity Deep Dive Project at the University of Wisconsin-Madison's Cooperative Children's Book Center. That's the background. And now, some thoughts on Diverse BookFinder. Their mission/vision statement says that they want to "diversify and balance bookshelves everywhere" and that they want to "move the diverse books discussion beyond a focus simply on the lack of numbers to also consider content and impact." They write that "improving cultural accuracy" is essential. I agree with all of that. But when I move beyond that page to other pages, I find problems. We can start with the Search page. After my tweets, Anne Sibley O'Brien, one of its founders, replied "This is really helpful, Debbie, suggests that we need a very clear statement on the site that inclusion in the site =/= recommendation." I'm not sure that statement helps. It seems to say "here's a way to find all the books" and "it is on you" to figure out if they're any good. For most people, some things will be obvious. If, for example, Little Black Sambo was reprinted, they would include it in their database. Most people, I think, would know that book is racist and wouldn't get it to use with children. They might use it in with adults in college classes, but not with children. I put "Native" in the search box. Returns are presented, ten per screen. As I paged through, I saw that a lot of the books have the "folklore" category. That's a problem. Some of those stories are creation stories. They aren't folktales and they ought not be considered within the same framework as Beauty and the Beast. Here's a screen cap of the Categories page at the Diverse BookFinder site. The first category is also a problem. It is "Any Child: Assimilation." I shared it, and KT Horning's "Culturally Generic/Neutral? ", too, with Anne. She knew of KT's and said it really influenced their thinking, but I'm having a hard time understanding what that means. I'm not able to connect the dots. Assimilation -- the word and what it represents -- is not positive. If you say that word to a Native person, they are likely recalling the many times the US government tried to make us into White people. That happened, overtly, in the boarding schools where the motto was to "kill the Indian" and to "save the man." There were other programs, too. Do the developers of the Diverse BookFinder need to keep that in mind as they create and use categories? I think so. In the list of categories on the left margin (it is different from the Category Chart that has "Any Child: Assimilation" -- which also confuses me), is "Tribal-Nation." I was glad to see that, because I figured that's where I'd find books about Native peoples as peoples of sovereign nations. But when I clicked on it, I was puzzled. It isn't specific to Native peoples of the US. Most of the tabs under it are Native Nations of the US but some are not. Two that are not are Bhil, and Massai. My expectation was wrong. I was confused at first and still wonder if "Tribal-Nation" is going to work for users or not. 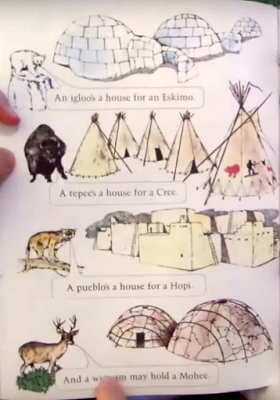 I saw two Pueblo nations in the list, but Elan, Son of Two Peoples is not about anyone from the Pueblo of Sandia. Elan is from Acoma. It says so, in the book. And Whispers of the Wolf is under the tab for Pueblo of Santa Clara, but it isn't set there. That one doesn't have a setting other than an ambiguous before contact with Europeans. A note inside from someone who is from Santa Clara doesn't mean the story should be labeled as a Santa Clara story. 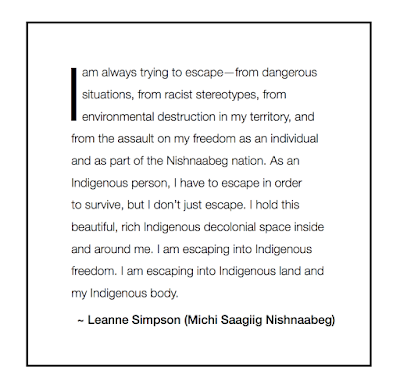 It isn't by a Native writer. So--the team that categorized these two books made errors. Creating a database that will be helpful to users means starting with words that will grab the books that should be scooped up in a particular search or category. In the Cherokee category, I see a book about a Chinese American film star and a book that is First Nations (Canada). The We Need Diverse Books app had some of those problems, too, but they asked me to look it over before they released it. Bottom line: I'm confused over what the project means to do. It seems to me that it is supposed to be a study. A research study. Of a collection in a college library that will be adding books to it. But the Finder part... just confuses me. I'm trying to make sense of it. For now, I can't recommend it. I'll check in on it from time to time.